Easy access from highway, nice for a 1 night layover. The price was great for 4 adults and 2 kids. Everyone had their own private space. Kitchen was well equipped. Clean space. Comfy beds upstairs. Nice outdoor space. And quiet place. Location is great. Is just near the forest, my window directly to trees! The area is secure, parking pkace the same. Unfortunately I can't swim in the pool because of cold weather. Nice rooms, plenty of space for family. Pool was nice, freezing cold. 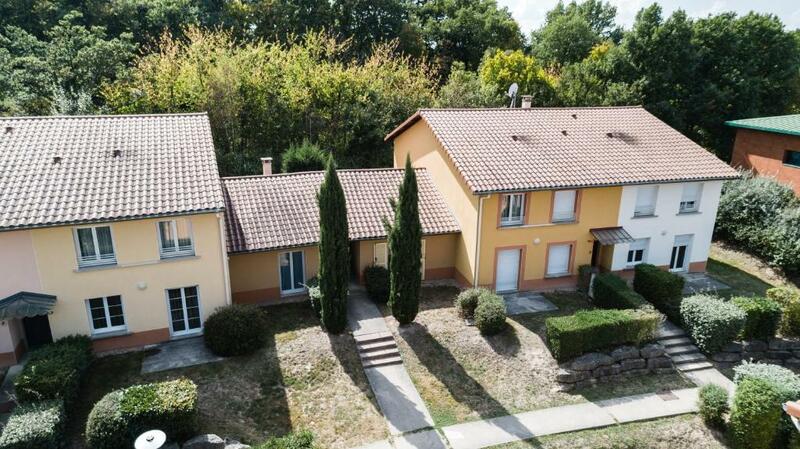 Good value, clean acccommodation for our extended family (in the 3 bed apartment) for a short stop over. Plenty of room, basic cooking facilities. Large spacious apartment and all we needed however if we were to be there and not with our friends we would have found it sparse of furniture. Doors opening onto the outside. Lovely! Big space of the apartment. And that is the only thing I liked. Very convenient, particularly with the family.The kitchen was well organized, There are big supermarkets and restaurants in the vicinity. I was also happy to see it was easy to go to Lyon on the highway. 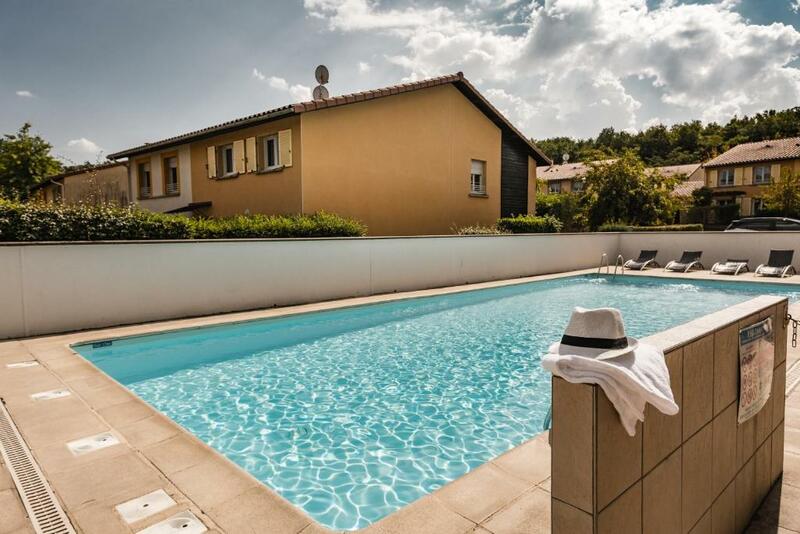 Featuring a seasonal outdoor pool, Garden & City Lyon - Lissieu is located in the Parc Tertiaire du Bois Dieu in Lissieu. 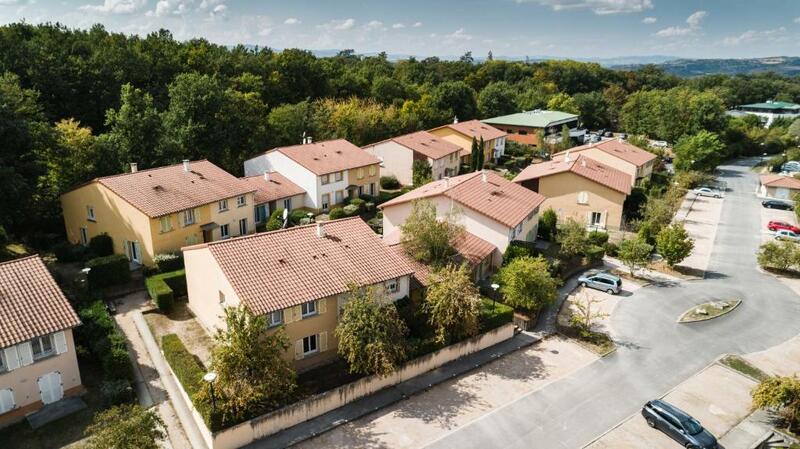 It is next the A6 motorway just 20 minutes' drive from central Lyon. Free WiFi is available in the accommodations. 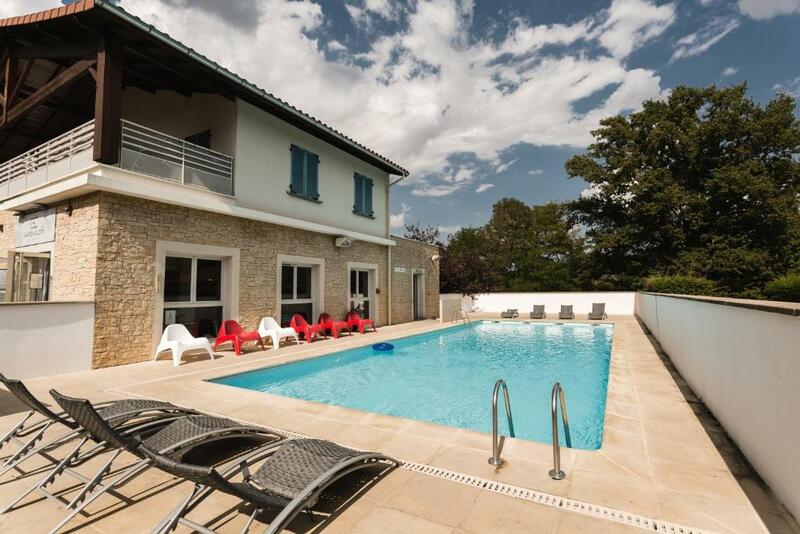 The villas feature a terrace, a fully equipped kitchen, a work desk and a private bathroom. Garden & City Lyon - Lissieu offers a breakfast service. Several restaurants can also be found within a 15-minute drive. The countryside in Lissieu is perfect for hiking and cycling. There are many sites to visit, including the Château de Lissieu 5 minutes' drive away. Free parking secured by a gate is available for guests. This property also has one of the top-rated locations in Lissieu! Guests are happier about it compared to other properties in the area. 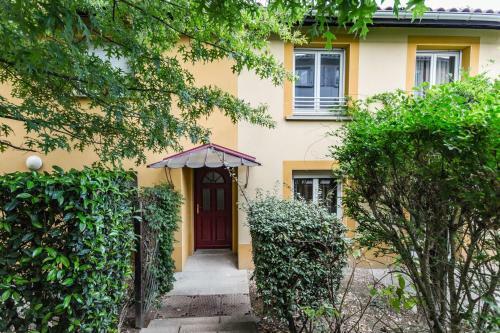 This property is also rated for the best value in Lissieu! Guests are getting more for their money when compared to other properties in this city. When would you like to stay at Garden & City Lyon - Lissieu? All villas include a sitting area and an LED flat-screen TV with satellite channels. They also have an equipped kitchen and a private bathroom. This villa features a stovetop, private entrance and kitchenware. 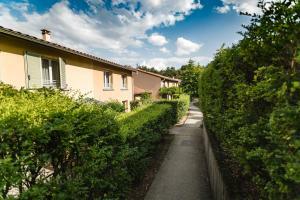 House Rules Garden & City Lyon - Lissieu takes special requests – add in the next step! Garden &amp; City Lyon - Lissieu accepts these cards and reserves the right to temporarily hold an amount prior to arrival. Garden & City Lyon - Lissieu accepts these cards and reserves the right to temporarily hold an amount prior to arrival. Sunday: from 07:30 to 12:30 and from 14:00 to 15:30. If you plan on arriving outside of these hours, please contact the residence in advance to obtain the necessary access codes. Contact details can be found on the booking confirmation. For stays of 1 to 8 nights, housekeeping is available at an additional cost. For stays of 9 nights or more, weekly housekeeping is included in the price. Cleaning includes towel and bed linen changing. Please note that your credit card will be pre-authorized upon arrival as a security deposit. The amount of the security deposit varies from EUR 300 to EUR 1000, according to the size of the apartment. Please contact the property for further information. Only a few places available for breakfast. We had to wait 30 minutes for a table. Very spacious accommodation. Very nice staff. A lot of the cutlery was missing - we only had 1 fork and 1 spoon! 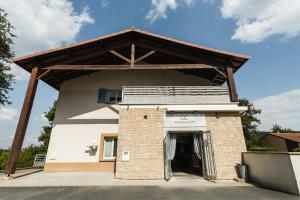 We were in this accommodation on the 23 of december 2018 and we have been there several times and before this last time it was always fine. This time we got a little house and inside what appeared to be a crack House fro junkies. The fronts of the cupboards in the kitchen were all came of. The bank was too dirty for words and no one would even let there dogs on this sofa [see picture] It seemed as if there was someone on give birth on this sofa or that anyone died on it. All dirty and greasy and this was a disappointment at the top. So Never Take PLEASURE With COTTAGE B07!! We were too tired to go to the reception to go for this, but this was a heavily disappointing experience And I am Sra Jose and not a male but a female!!!! When we entered last night the gate was already open because someone had just entered. When we wanted to leave early this morning the gate didn't open at all!!!! We couldn't find a number to call, no possibility to reach any one. Only after we tried several code combinations the gate opened. They gave us the wrong gate number. We were VERY dissatisfied!!! A mistake can be made, but make sure you can be reached to help someone. Very bad service!!! The place was dirty, the crockery and cooking utensils required washing before using, as they had food still on them. The worktops and tiles were filthy. The cupboards were falling to bits, the extractor lights don't work. The freezer door in the fridge was missing. The were stain marks on the sofa. The carpet in the bedroom was dirty and stained. The light in the hall way did't work. Cats roaming around all over the place, rubbish was left to blow about in the garden. If this property was in the UK it would be closed down by Enviromental Health. The staff were argumentative and extremely aggressive!! My automobile broke down on the way there. I used google translate to request the postponement of my arrival when my car would be repaired. If anything positive came out of it, I don't know. My knowledge of French is nil. A little tired. Could do with some paint. This added to it feeling unclean. We had to bring our own kettle. Fold out bed was about impossible to sleep on due to lumps and wires. There were almost no furnitures. In the bedroom there were no night lamps. No hairdryer. No iron. Limited amount of toilet paper. The terrace was simply a flat piece of concrete. Deposit issue. I dont mind paing it. I paid cash, but could not get it back in cash. Takes ages to get it back to credit card. Almost month, but I still did not receive deposit money to my card. They say it is bank's problem, but I don't know.